Estudie sus vinos húngaros con esta degustación nocturna de 2 horas en Budapest. 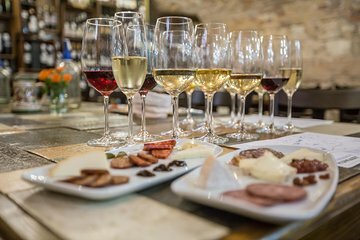 Dirigido por un guía experto, se le dará una introducción a las características regionales, degustar ocho variedades en una tienda de vinos local y compartir sus ideas con sus compañeros. Haga preguntas mientras toma las notas de sabor, combinando sus muestras con pogácsa, galletas saladas tradicionales. Para mantener la degustación lo más íntimo posible, los grupos se limitan a 14 personas. Pruebe ocho deliciosas muestras de vino húngaro de origen directo de los productores. Aprende a reconocer las diferentes notas y aromas de cada variedad. Escuche todo sobre la vinificación húngara y las características de los vinos de diferentes regiones. This was one of the best wine tasting experiences I have had (thanks, Tamas!). Tamas talked continuously for almost 2 hours while the three of us sampled what I think it was 7 wines, including a sparkling white wine. He went over the history of Hungarian wines, the various regions, the types of grapes they produce, the methods of production and more. It was everything you ever wanted or needed to know about Hungarian wines but didn't know what to ask! With some sample cheeses and meats, the wines were magnificent. I felt so much more knowledgeable, but not overwhelmed by the presentation. It was quite satisfying, and when I went on two other wine tours, it helped me understand the context of Hungarian wines. This tour is sponsored by the Tasting Table, which I highly recommend. Try to do this one upon arrival in Budapest so you can enjoy the right kind of wine with your dinner. Absolutely a highlight of my time in Budapest. Our guide was so knowledgeable and passionate about wine, we learned so much and drank so many different types I felt I understood the different regions in Budapest by the end. The food was also great. All in all, a perfect way to spend 2 hours in Budapest. Excellent tasting of 8 high quality wines. Tamas was a superb host with a willingness to share wonderful details about Hungary and its wine history. The portions were very generous. And the teacher was extremely well informed and answered all our questions. It takes place in a wine cellar with lots of character. If you are at all interested in Hungarian wines, this is the place to go. Amazing experience! Wine was splendid! The food too! And what was especially pleasant is that I got personal service. I was the only one to book this tour for this day and they made a dedicated presentation only for me! A really enjoyable evening! The cellar venue is cozy and intimate and the hosts made us feel extremely welcome and included. I don't know a huge amount about wine, and especially not Hungarian wine, but I found it absolutely fascinating listening to the sommelier talk about the wines, and the wine itself was delicious! There were around 20 people attending the evening in total, and we were sat around 2 large communal tables, which meant that the evening had a friendly atmosphere and by the end we were chatting away merrily with all the other guests. Around half the people there were locals too, which gave it a really authentic feel. It was also a great value evening, as there was a lot of wine included and plenty of nibbles and snacks. Can highly recommend. This is simply the best way to end a day. I can highly recommend to do this. The evening had a perfect balance between tasting wines, enjoying some delicious traditional Hungarian cuisine and listening to our hosts telling us about the wines. Must do!